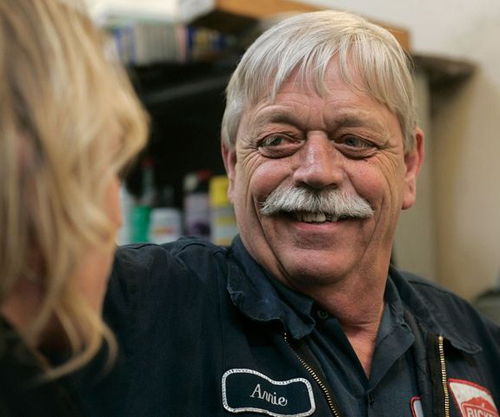 After 49 years with Bickford Motors, Arnie has retired! What an incredible employee and awesome man you are and have been. We are really going to miss you. We wish you the best and hope you have fun with all your projects. Here is a great article by Bill Sheets at the Herald of Everett. It was also posted on MSNBC. SNOHOMISH — The world today is very different from how it was in 1962, but one thing has been the same: Arnie Johnson has worked at Bickford Ford. When Johnson was 17, his neighbor ran the used car department at the Snohomish dealership. Johnson, now 66, worked as a mechanic for most of those years. The dealership celebrated his retirement with a party on Friday (April 29th, 2011), his last day. The feeling is mutual. Johnson is not only a gifted mechanic but has been an all-round great employee, service director Bob Bickford said. Arnie Johnson shares that stability with his co-workers — many of whom have worked for the business for a long time, he said — and his employers. Johnson has worked with four generations of Bickfords, starting with Lawrence Bickford, who started the dealership in downtown Snohomish in 1934. Between washing cars and becoming a mechanic, Johnson spent a couple of years working at the family’s gas station, body shop and car-detailing operation. “I was 2 years old sitting in my backseat as my mother drove up to have Arnie put gas in our car,” said Bob Bickford, now 50. Lawrence Bickford was active in the community and when he bought acreage on what is now Bickford Avenue, the road was named for him, said Bob Bickford, his grandson. The dealership moved there in 1971. “The family’s been great,” Johnson said. They also were there when he needed them the most. In 2004, he and his son, Ole, 26, were on their way to Idaho to buy a 1976 Ford Bronco that Ole planned to restore. They were in an accident and his son was killed. Afterward, the Bickfords secretly bought the Bronco and presented it to Johnson on his next anniversary with the dealership. “That was part of the healing process for me,” Johnson said. Johnson restored the Bronco as he has many other vehicles, his daughter said. As long as she can remember, he was restoring cars, boats and tractors or actually building them from the ground up with salvaged parts. Johnson is retiring now, he said, because it’s just time and he’s ready to do some other things, like take short trips around the Northwest. He’ll also probably keep building things that move. “I don’t know if I could stop,” he said. And Johnson might not entirely stop working at Bickford. He could fill in occasionally for mechanics on vacation. “I never did hate coming to work,” he said.